Michael Pataki (January 16, 1938 – April 15, 2010) was an American character actor and voice actor. Pataki was born in Youngstown, Ohio. His parents were Hungarian. He was the youngest of three children - one older brother and one older sister. He attended the University of Southern California with a double major in political science and drama. His career was launched at a summer stock festival in Edinburgh in 1966, with a review that read, "Michael Pataki went beyond the bounds of mere nationality in his tense and moving interpretation of Jerry in The Zoo Story". Pataki was so well loved that at a reception for the theatre group acclaimed English actor Laurence Harvey, whom Pataki had never met, said he was magnificent and gave him a kiss on the mouth. Pataki appeared as a guest star in numerous television productions, from the black and white days of Hawaiian Eye, M Squad, The Twilight Zone, Ripcord, Combat! and My Favorite Martian, to early color shows such as The Flying Nun, All in the Family, Mr. Terrific, Garrison's Gorillas, Bonanza, Run for Your Life, Mission: Impossible, Mannix, Batman and Felony Squad. He was also a regular on Paul Sand in Friends and Lovers and The Amazing Spider-Man, and had a re-occurring role on McCloud as well. One of his most famous roles was as "Korax", the brash, loudmouthed Klingon who provoked the bar fight in "The Trouble with Tribbles" episode of Star Trek. He also played Governor Karnas on the Star Trek: The Next Generation episode "Too Short a Season" and George Liquor in the episodes of The Ren & Stimpy Show entitled "Dog Show" and "Man's Best Friend". He was also the voice of The Cow in Mighty Mouse: The New Adventures, along with many other secondary characters. Pataki played a guest spot on Happy Days Season 4 as Myron "Count" Malachi, one half of the Malachi Brothers. He was made famous on Happy Days for his line "Let the pigeons loose." 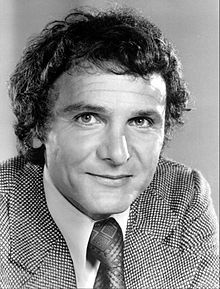 He played a Russian defector in the episode "The Americanization of Ivan" in WKRP in Cincinnati. Barney Miller. Pataki directed the 1977 film version of Cinderella. He also co-produced the filming of the stage presentation of Pippin with David Sheehan, starring William Katt. Pataki was also an accomplished voice over artist, playing the part of the Sewer King in an episode of Batman: The Animated Series. He was the voice of George Liquor for The Ren & Stimpy Show production house Spümcø until 1997. Pataki died from cancer on April 15, 2010 at the age of 72. ^ Obituary Los Angeles Times, May 5, 2010; page AA7. This page is based on the Wikipedia article Michael Pataki; it is used under the Creative Commons Attribution-ShareAlike 3.0 Unported License (CC-BY-SA). You may redistribute it, verbatim or modified, providing that you comply with the terms of the CC-BY-SA.